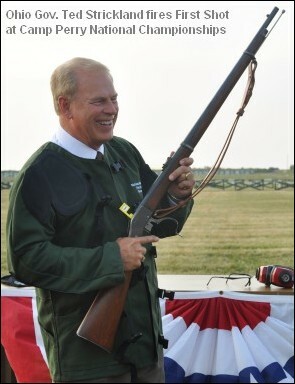 Ohio Governor Ted Strickland Officially Opened the 2010 National Matches Monday evening at Camp Perry, Port Clinton, Ohio. 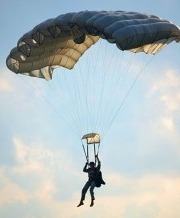 Last night’s First Shot Ceremony officially kicked off the National Rifle and Pistol Matches at Camp Perry with many special guests, including Ohio National Guard parachutists, who jumped from a Blackhawk helicopter to deliver the American flag. The colors were raised by a JROTC Color Guard as the Army Band played the National Anthem. The U.S. Congress and President Theodore Roosevelt founded the National Matches in 1903 to foster national defense preparation through marksmanship competition. The 2010 National Matches consist of the National Trophy Rifle and Pistol Matches and the Small Arms Firing Schools, which are mandated by federal law and governed by the CMP, together with the NRA National Rifle and Pistol Championships, which are conducted by the NRA in conjunction with the National Matches. Overall, the National Matches bring over 6,000 competitors, volunteers, vendors and family members to Camp Perry each summer. All events are open to the public. NRAnews.com will be broadcasting live from Camp Perry today from 12-3 pm Eastern time. Share the post "Ceremonial First Shot Starts 2010 National Matches at Camp Perry"